Tsui Wah is a no-frills Hong Kong style café with a menu offering a variety of baked rice, sandwich and stir fried noodles combinations. 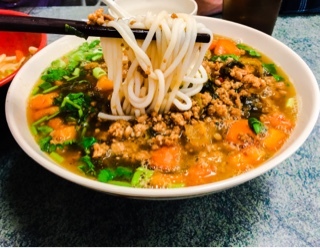 However, there is something a little more interesting and rarer, a style of cooking generally not found in other establishments, Guilin style noodles. A cacophony of crunchy peanuts, pickled vegetables, vegetables and some sort of protein, it’s a more flavourful dish thanks to the area’s Sichuan influences. If you’re into a stronger dish with a variety of textures, you’d want to give this a try. Of the two varieties at Tsui Wah, the beef Guilin style lo vermicelli ($8.25) provided a richer version of the dish. 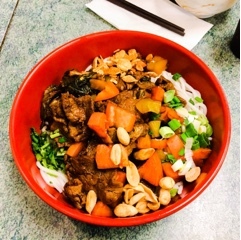 Lo essentially translates to ‘mix’, the bowl of noodles topped with pickled cabbage, bamboo, peanuts, tomatoes, fried garlic slivers, green onions and cilantro that you mix together. The sauce is soy sauce based with a more potent taste from spices used in it. Unlike the traditional dish, it wasn’t spicy but few drops of the intense chili oil on the table did the trick. 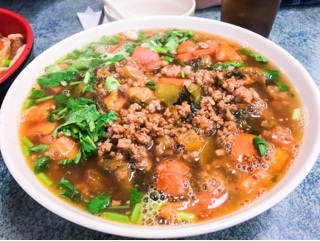 Whereas, the soup version, pictured here is the Guilin style minced pork vermicelli ($7.50) is lighter. Seemingly, they use the same soy sauce base but it’s diluted with a broth to mellow out the flavours. The ingredients used are the same, except in this case substituting minced pork for the stir fried beef. Although the menu describes both dishes as ‘vermicelli’, the noodles are actually Guilin rice noodles also known as ‘mifen’. It’s about the thickness of ramen and the texture of Korean potato starch noodles – a bit chewy and doesn’t become soggy when left in the broth. There’s a silkiness to these delicate slippery noodles. 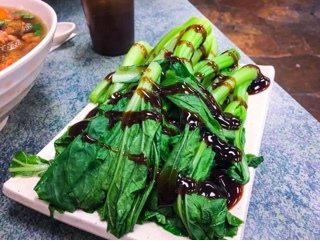 Just in case the bowls don’t contain enough vegetables, there’s always the opportunity to add some boiled yu choy with oyster sauce ($3.99) on the side. Tsui Wah provides a decent portion for the price. Located in a non-descript commercial area down Kennedy Road, who knows how many times I’ve whizzed past the place. I’m glad my father decided to slow down and take a chance on the restaurant; otherwise, I wouldn’t have been introduced to it! Maybe it’s something we should all do more, just drive and stop at small establishments without all the glitz and reading about it first. Something I’ll try to do more of this year – after all, who knows what you’ll discover?